Is it weird for two expats from North America to write about how London inspires them? In a city where everyone is from somewhere else, it can be a rarity to meet a born-and-bred Londoner. What we love most though are the ideas that everyone brings with them and how they are shared and generate new bursts of inspiration. The result is a ‘creative cluster’ of talent and community – themes that we’ve talked about in the past on our podcast. London is a ripe with places for makers to find inspiration, supplies and other like-minded individuals to collaborate with. 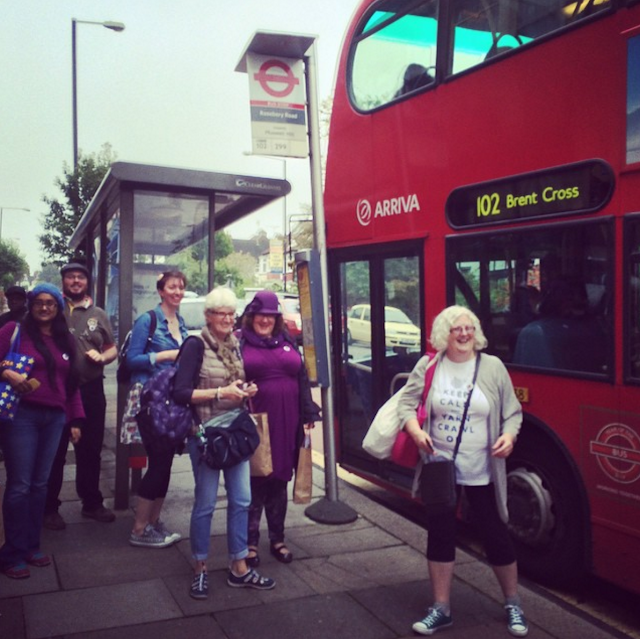 The Great London Yarn Crawl grew out of our exploration of the city’s myriad yarn shops and was built on an idea from North America. When it can seem like most people aren’t valuing handcrafts any more, it’s reassuring to see how just how many yarn shops a large city can produce and support, and how they’ve each managed to carve out their own niche. With all the amazing talent and vision flowing in London, it’s hard not to feel constantly jazzed and inspired. We feel so incredibly lucky and grateful to have been able to turn that inspiration into Yarn in the City - sharing and promoting the making community through our book, the London Craft Guide, and our various events. As makers there’s something intimate about sharing our favourite places and finds, like telling a secret or whispering insider information. It’s a good thing we’re terrible at keeping secrets! And that there are so many great shops, designers and other makers for us to explore. Unintentionally, as we’ve fallen in love with our adopted country, our enthusiasm for the yarn-world has expanded beyond London. This November we’re proud to be hosting the first ever Yarnporium in London – a marketplace featuring some of our favourite makers from across the UK. We hope it will be a good excuse for crafters to come to London in search of their own creative spark and inspiration. Yes, I'll be there!! If you’d like to keep up with Allison and Rachel and their goings-on with Yarn in the City you can visit their website (here) and sign up to their newsletter (click the blue bar at the top of the page). You can also follow them on Instagram. And if you’d like to join this year’s Great London Yarn Crawl there are still a handful of tickets available (I'm going to that too!). You can find the rest of the posts in this series here, and join in with your own stories of location- inspired crafting, using #makerspostcards on Instagram. Be sure to tag me @craftsfromthecwtch.